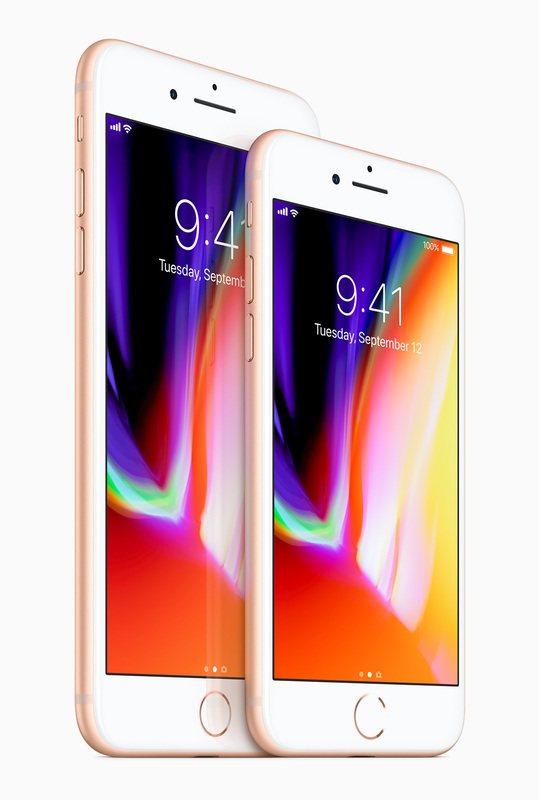 Apple on Tuesday unveiled their new iPhone 8 and iPhone 8 Plus handsets. The new devices feature a new glass and aluminum design, a Retina HD display, an A11 Bionic chip, improved cameras, and much more. Both devices will be available for pre-order beginning Friday, September 15 in more than 25 countries and territories, and in stores beginning Friday, September 22. The new iPhone 8 and iPhone 8 Plus boast a glass back design, in three new finishes: space gray, silver and gold. The glass finish is manufactured using a seven-layer color process for precise hue and opacity, delivering a rich depth of color with a color-matched aerospace-grade aluminum bezel, and is water and dust resistant. The device’s new 4.7-inch and 5.5-inch Retina HD displays with the addition of True Tone adjust the white balance of the display to match the surrounding light for a more natural, paper-like viewing experience. Redesigned stereo speakers are up to 25 percent louder and deliver deeper bass, enabling richer-sounding music, videos and speakerphone calls. Apple says the A11 Bionic is the most powerful and smartest chip ever in a smartphone, features a six-core CPU design with two performance cores that are 25% faster and four efficiency cores that are 70% faster than the A10 Fusion. A11 Bionic also integrates an Apple-designed GPU with a three-core design that delivers up to 30% faster graphics performance than the previous generation. The devices feature an improved 12-megapixel camera with a larger and faster sensor, a new color filter and deeper pixels. A new Apple-designed image signal processor delivers advanced pixel processing, wide color capture, faster autofocus in low light and better HDR photos, while a new quad LED True Tone Flash with Slow Sync results in more uniformly lit backgrounds and foregrounds. The new camera is tuned to offer an excellent AR experience. Each camera is individually calibrated, with new gyroscopes and accelerometers for accurate motion tracking. The A11 Bionic CPU handles world tracking, scene recognition and the GPU enables incredible graphics at 60fps, while the image signal processor does real-time lighting estimation. The new camera offers better video stabilization, 4K video up to 60fps and 1080p slo-mo up to 240fps. With iOS 11, both iPhone 8 and iPhone 8 Plus support HEIF and HEVC for up to two times compression and storage for twice the photos and videos. 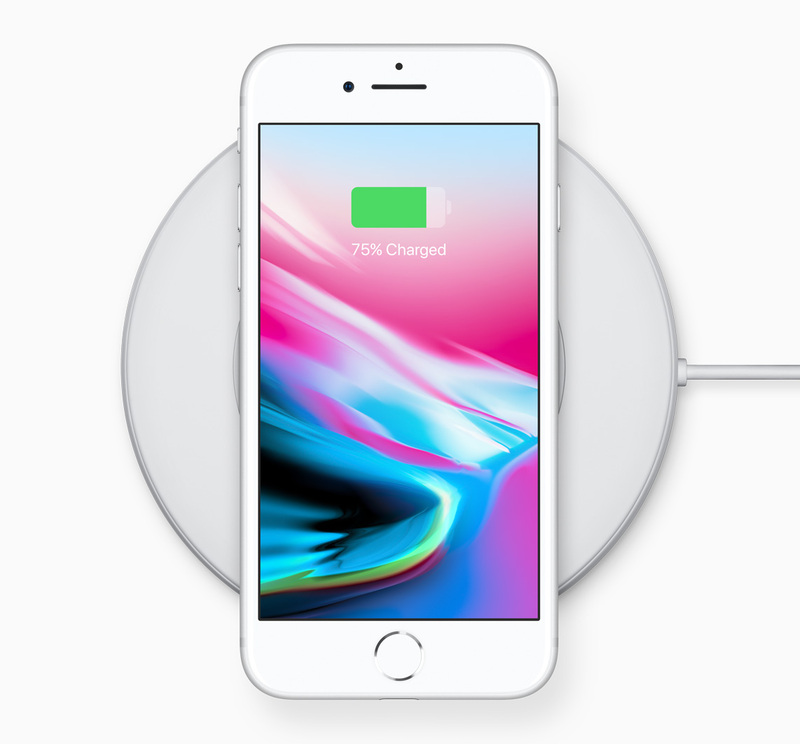 The iPhone 8/8 Plus’ glass back also allows for the device’s use with Qi compatible wireless charging solutions. Apple will offer two new wireless charging mats from Belkin and mophie. 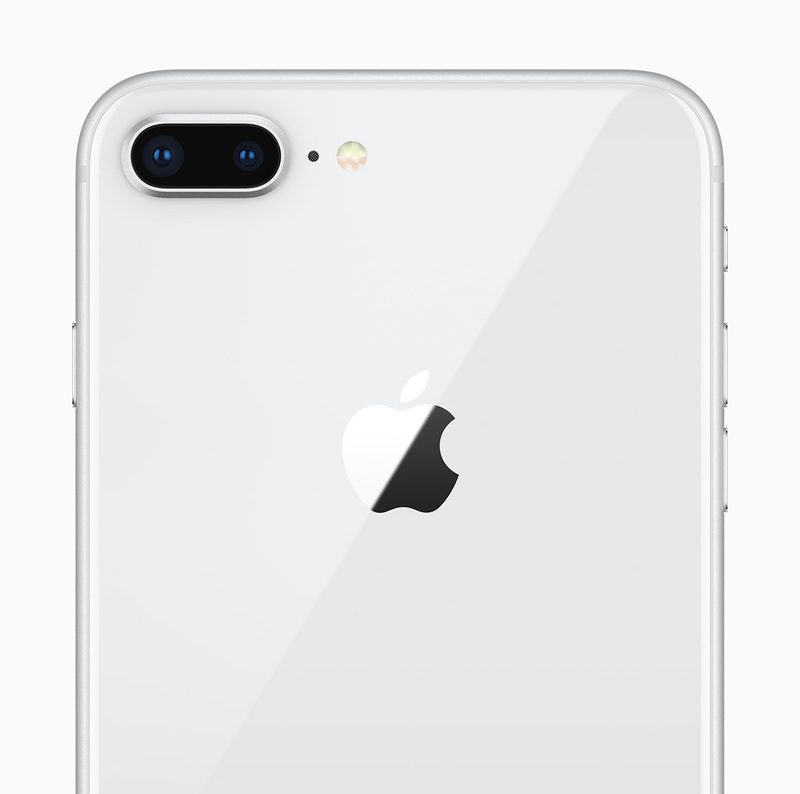 Through Apple’s iPhone Upgrade Program, customers in the US can get iPhone 8 and iPhone 8 Plus, with the protection of AppleCare+, choose their carrier (no multiyear service contract required) and have the opportunity to upgrade to a new iPhone every year. 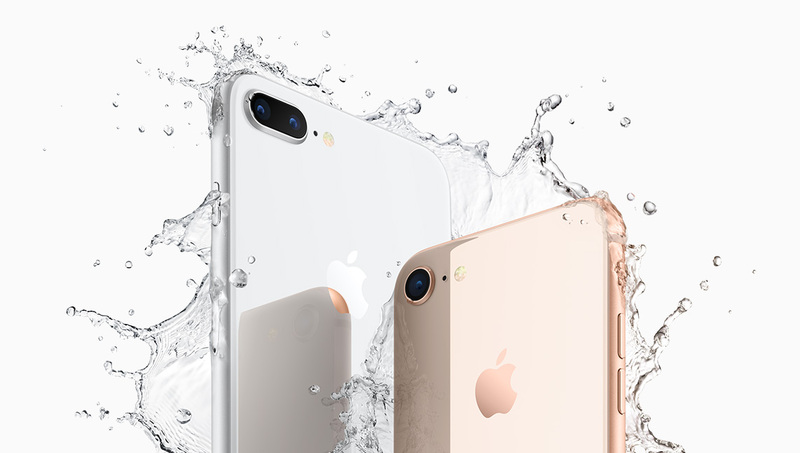 The iPhone Upgrade Program is available for iPhone 8 and iPhone 8 Plus at apple.com and Apple Stores in the US with monthly payments starting at $34.50 for iPhone 8 and $39.50 for iPhone 8 Plus. 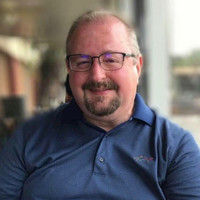 The handsets will be available in Andorra, Bahrain, Bulgaria, Croatia, Cyprus, Czech Republic, Estonia, Greece, Greenland, Guernsey, Hungary, Iceland, India, Isle of Man, Israel, Jersey, Kuwait, Latvia, Liechtenstein, Lithuania, Malta, Monaco, Poland, Qatar, Romania, Russia, Saudi Arabia, Slovakia and Sloveniabeginning Friday, September 29. Apple-designed accessories including leather and silicone cases in a range of colors will be available starting at $35 (US). Lightning Docks in color-matching metallic finishes will also be available for $49 (US). Every customer who buys iPhone 8 or iPhone 8 Plus from Apple will be offered free Personal Setup in-store or online to help them customize their iPhone by setting up email, showing them new apps from the App Store and more. 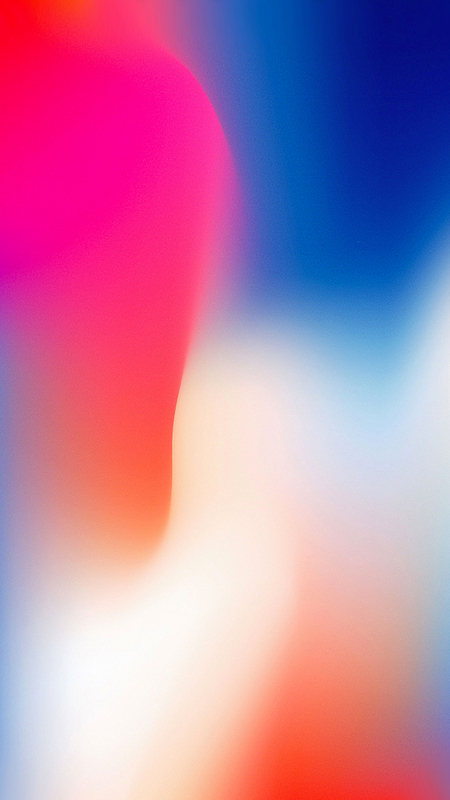 Anyone who wants to start with the basics or go further with iPhone 8, iPhone 8 Plus or iOS 11 can sign up for free Today at Apple sessions at apple.com/today.